Compared with the thirty-four other countries in the Organisation for Economic Co-operation and Development (OECD), until recently the United States boasted the highest corporate tax rate, but with the signing of the Tax Cuts and Jobs Act of 2017 in December, the United States significantly lowered its rate from thirty-five percent to twenty-one percent. Going into 2018, the only OECD countries that maintain a thirty percent or higher rate are Australia, Belgium, France, and Mexico. 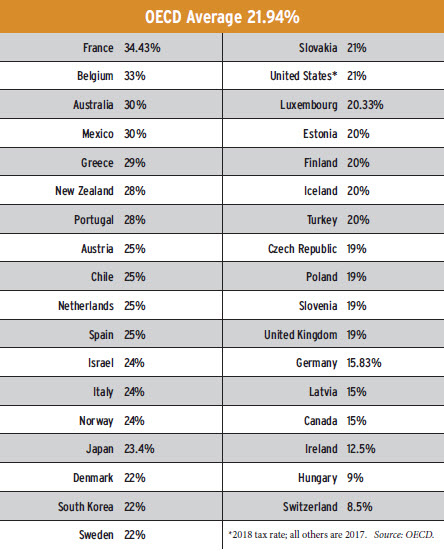 On the other hand, some countries are under ten percent (see Hungary and Switzerland). So, with its new corporate tax rate, how does the United States—now much closer to the OECD average—compare with the rest of the OECD countries?